This elegant bracelet is created in 14 Karat white gold. 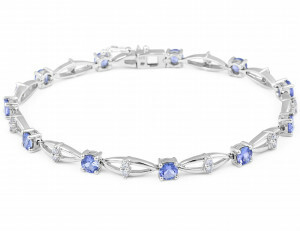 It features alternating round tanzanites and diamonds set with claws. The bracelet has been designed to follow the movement of the wrist and it has a multi dimensional feel to it. This Classic style bangle set in 18 karat white gold and diamond showcases 18 round brilliant cut E in colour and VVS2 in clarity . 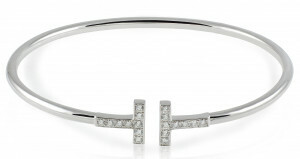 This chic diamond Bangle features a sleek shiny-finish bar surrounded by a delicate row of pave-set diamonds. 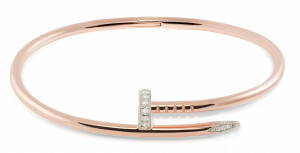 Clasped with a hinge, this 18 karat rose gold piece is perfect for everyday wear.